The brilliant red of the Tibetan monk’s robe and his shaved head caught my eye as he sped along on a motorcycle. A little further along I saw another Tibetan monk chatting on a mobile phone. Then two more buying fruit in the market. I was on my way to Madikeri, Coorg and was passing through Kushalnagar where a Tibetan settlement is located nearby in Bylakuppe. 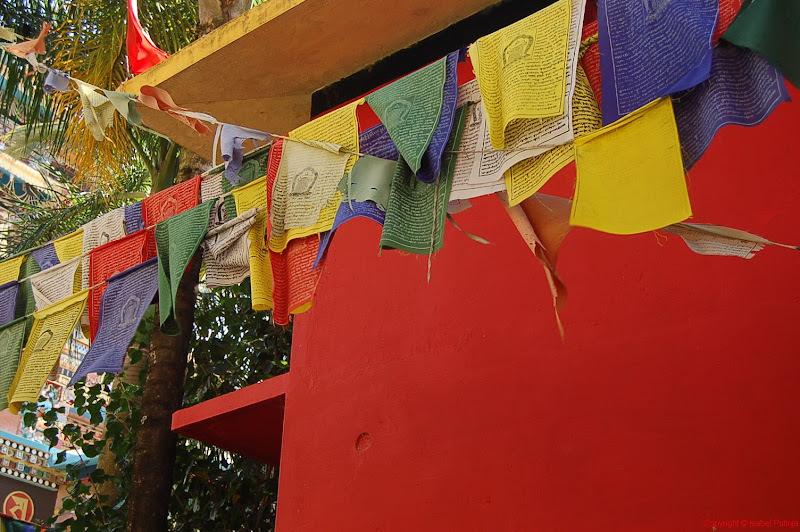 There are over 35 Tibetan settlements located throughout India which were established in the 1960s when the Indian government offered land to Tibetan refugees fleeing the Chinese occupation. Dharamsala in the North Indian state of Himachal Pradesh is the best known settlement because that’s where the Dalai Lama resides and has established a government-in-exile. However the largest number of exiled Tibetans are found here in the South Indian state of Karnataka, where 50,000 live and work in five settlements spread across the state. 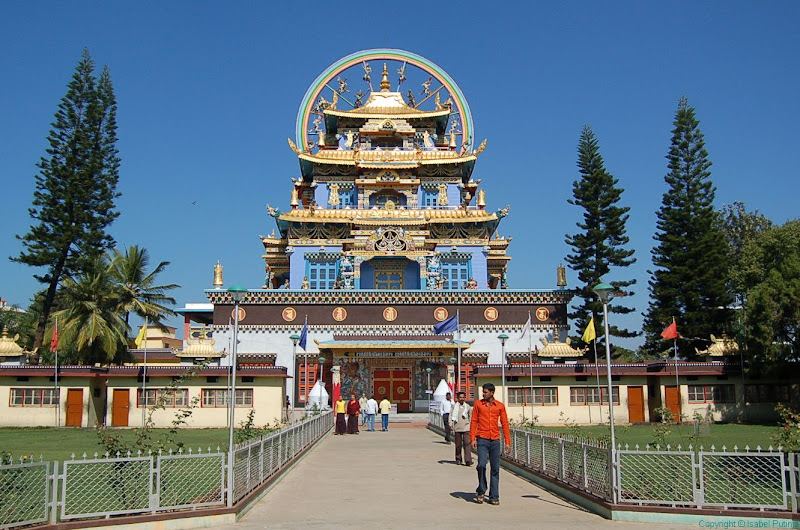 I visited the Namdroling monastery in Bylakuppe and discovered a sprawling settlement covering many acres of agricultural land. 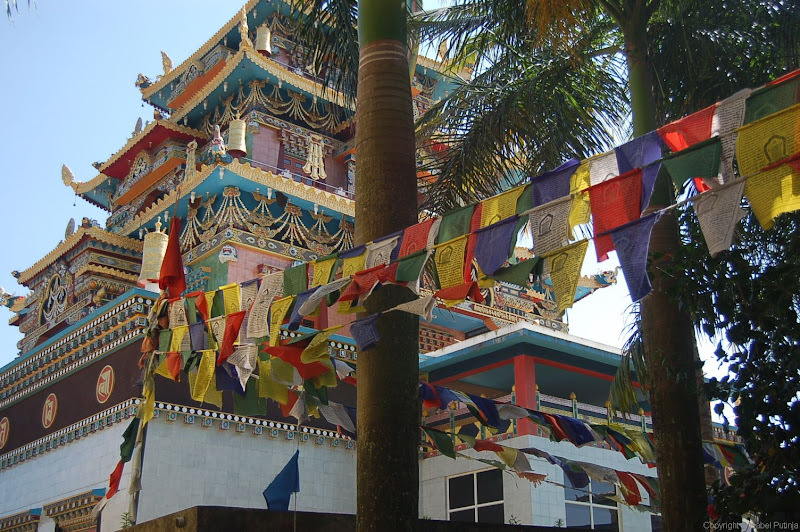 There were Tibetan prayer flags flying in the wind and signs asking you to “boycott Chinese goods”. The monastery is known for it’s magnificent Tibetan-style temple, the Padmasambhava Buddhist Vihara, more commonly known as the Golden Temple. I left my sandals outside and climbed the steps to the entrance. A sign outside said: “Please refrain from running and shouting”. Once inside, a boisterous crowd of Indian schoolchildren dressed in blue uniforms was doing exactly that! 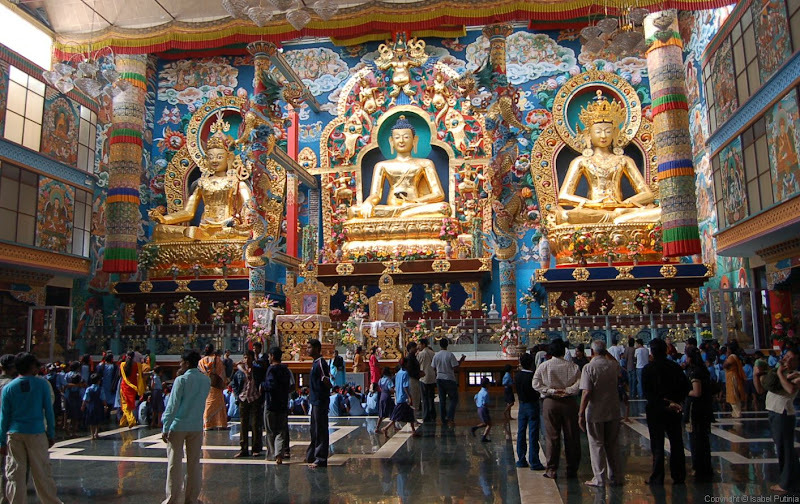 Three elaborately-decorated golden statues dominate the interior, representing Lord Buddha, Guru Rinpoche – considered to be the ‘second Buddha’, and the Buddha of long life. 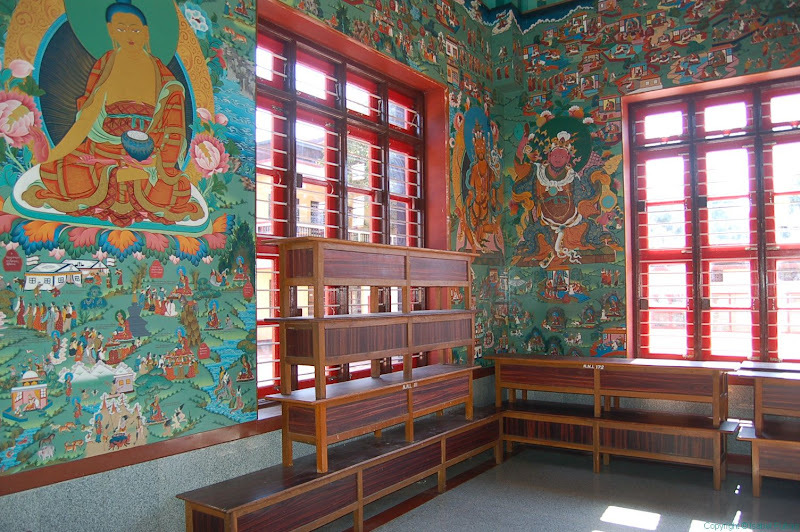 The walls of the temple are covered with exquisite paintings of male and female deities. Not knowing much about Tibetan Buddhism, this place is somewhere I'd like to come back to and spend some time to learn more about these exiled people and their religion. I SO enjoyed this post and the photos. Thanks! where exactly in karnataka is this? and if you'd like to learn more about tibet and buddhism, you can visit my blog.